High Tea, an enjoyable English Tradition! What could be finer than High Tea at the Drake Hotel? This was on my wish list for years and finally this past weekend I met up with my Chicago friend Linda Spanberger and we indulged ourselves in the splendor of this beautiful ritual. The Drake Hotel located at 140 East Walton Place was founded in 1920 by Tracy and John Drake. The High Tea was held in the restaurant off the lobby called the Palm Court and International Club where our High Tea was served. We arrive right on time for our three o’clock reservation and we were delighted to be seated next to the fountain and the harpist who played many songs including Happy Birthday which we took to be a personal tribute to Linda who had just celebrated her big day the week before. After our tea selection (which by the way is quite a chore deciding between the two page selection) we sat and watched the other visitors, which much to our surprise, included several couples and even one gentleman by himself enjoying tea and a book. Our waitress brought a 3-tier tray filled with breads, petite sandwiches and pastries. The food was fabulous perhaps enhanced by the lilting harp music, the trickling fountain and the uncharacteristically cold weather outside that had us glad to be ensconced in the lovely splendor of the Palm Court. Because of the cold we didn’t don our heels and dresses although several of the females in attendance did. We looked through a book showing many of the notables that had stayed at the Drake hotel before. The Queen of England and even Princess Diana not long before her tragic death had been a hotel guest at the Drake. We felt in good company as we sipped and dined. 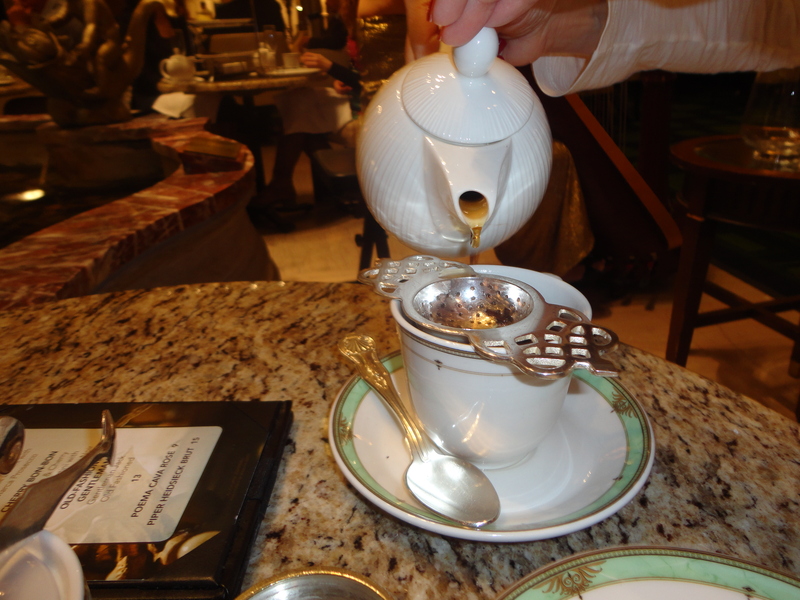 If you are looking for a relaxing step back in time to a graceful era where no one is rushed and beauty is all around you, consider doing what we did and have a “spot of tea” at the Drake! Next Post: Fun at the Lincoln Park Zoo!